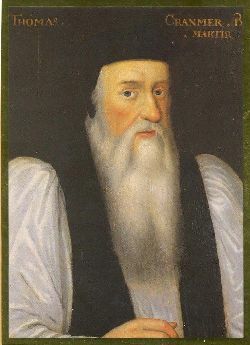 Thomas Cranmer served as the first Archbishop of the Church of England under Henry VIII and Henry's son, Edward VI. He authored the Book of Common Prayer of 1549 and 1552. He was instrumental in establishing the Church of England as a Reformed Protestant Catholic Church under Edward VI. He authored or edited the first official set of homilies for the Church of England and the Articles of Religion. He is the architect of the Anglican faith. 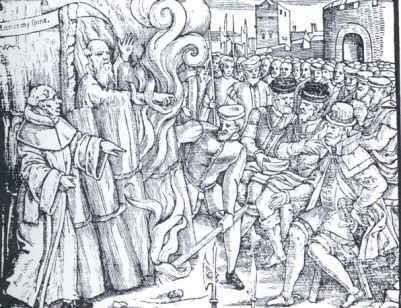 Cranmer was martyred at the stake on 21 March 1552 under Queen Mary for his faith. He had yielded to the inquisition and confessed error in his theology, but recanted on the day he was to make his public confession before his execution for "treason". His friends, bishops Hugh Latimer and Nicholas Ridley, preceded him at the stake on 16 October 1555. "I have sinned, in that I signed with my hand what I did not believe with my heart. When the flames are lit, this hand shall be the first to burn". IT is not to bee maruelled that worldly men doe feare to die. For death depriueth them of all worldly honors, riches, and possessions, in the fruition whereof, the worldly man counteth himselfe happy, so long as hee may enioy them as his owne pleasure: and otherwise, if he bee dispossessed of the same, without hope of recouery, then he can none otherwise thinke of himselfe, but that hee is vnhappy, because he hath lost his worldly ioy and pleasure. Alas thinketh this carnall man, shall I now depart for euer from all my honours, all my treasure, from my countrie, friends, riches, possessions, and worldly pleasures, which are my ioy and heartes delight? Alas that euer that day shall come, when all these I must bid farewell at once, and neuer to enioy any of them after. Wherefore it is not without great cause spoken of the Wise man, O death, how bitter and sowre is the remembrance of thee to a man that liueth in peace and prosperitie in his substance, to a man liuing at ease, leading his life after his owne minde without trouble, and is therewithall well pampered and fedde? There bee other men, whom this world doeth not so greatly laugh vpon, but rather vexe and oppresse with pouertie, sickenesse, or some other aduersitie, yet they doe feare death, partly because the flesh abhorreth naturally his owne sorrowfull dissolution, which death doeth threaten vnto them, and partly by reason of sickenesses and painefull diseases, which be most strong pangues and agonies in the flesh, and vse commonly to come to sicke men before death, or at the least accompanie death, whensoeuer it commeth. Although these two causes seeme great and weightie to a worldly man, whereupon hee is mooued to feare death, yet there is an other cause much greater then any of these afore rehearsed, for which indeede he hath iust cause to feare death, and that is the state and condition wherevnto at the last end death bringeth all them that haue their hearts fixed vpon this world, without repentance and amendment. This state and condition is called the second death, which vnto all such shall ensue after this bodily death. And this is that death, which indeed ought to be dread and feared: for it is an euerlasting losse without remedy of the grace and fauour of GOD, and of euerlasting ioy, pleasure, and felicitie. And it is not onely the losse for euer of all these eternall pleasures, but also it is the condemnation both of body and soule (without either appellation, or hope of redemption) vnto euerlasting paines in hell. Vnto this state death sent the vnmercifull and the vngodly rich man (that Luke speaketh of in his Gospel) who liuing in all wealth and pleasure in this world, and cherishing himselfe dayly with dainty fare, and gorgious apparell, despised poore Lazarus that lay pitifull at his gate, miserably plagued and full of sores, and also grieuously pined with hunger. Both these two were arrested of death, which sent Lazarus the poore miserable man by Angels anon vnto Abraham's bosome, a place of rest, pleasure, and consolation: but the vnmercifull rich man descended downe into hell, and being in torments, he cryed for comfort, complaining of the intolerable paine that he suffered in that flame of fire, but it was too late. So vnto this place bodily death sendeth all them that in this world haue their ioy and felicity, all them that in this world be vnfaithfull vnto GOD, and vncharitable vnto their neighbours, so dying without repentance and hope of GOD'S mercy. Wherefore it is no maruaile, that the worldly man feareth death, for hee hath much more cause so to doe, then he himselfe doeth consider. Third. but the chiefe cause aboue all other, is the dread of the miserable state of eternall damnation both of body and soule, which they feare shall follow, after their departing from the worldly pleasures of this present life. For these causes be all mortall men, (which be giuen to the loue of this world) both in feare, and state of death, through sin (as the holy Apostle saith) so long as they liue here in this world: But (euerlasting thankes be to Almightie GOD for euer) there is neuer a one of all these causes, no nor yet them altogether, that can make a true Christian man afraid to die (who is the very member of Christ, the Temple of the holy Ghost, the sonne of God, and the very inheritour of the euerlasting kingdome of heauen:) but plainely contrary, hee conceiueth great and many causes vndoubtedly grounded vpon the infallible and euerlasting trueth of the word of GOD, which mooueth him not onely to put away the feare of bodily death, but also for the manifold benefits and singular commodities which ensue vnto euery faithfull person by reason of the same, to wish, desire, and long heartily for it. For death shall bee to him no death at all, but a very deliuerance from death, from all paines, cares, and sorrowes, miseries, and wretchednesse of this world, and the very entry into rest, and a beginning of euerlasting ioy, a tasting of heauenly pleasures, so great, that neither tongue is able to expresse, neither eye to see, nor eare to heare them: nor any earthly mans heart to conceiue them. So exceeding great benefits they be, which GOD our heauenly Father by his meere mercy, and for the loue of his Sonne Iesus Christ, hath laid vp in store, and prepared for them that humbly submit themselues to GOD'S, and euermore vnfainedly loue him from the bottome of their hearts. And wee ought to beleeue that death being slaine by Christ, cannot keepe any man that stedfastly trusteth in Christ, vnder his perpetuall tyrranie and subiection: but that hee shall rise from death againe vnto glory at the last day, appointed by Almightie GOD, like as Christ our head did rise againe, according to GOD'S appointment, the thirde day. For S. Augustine saith, The head going before, the members trust to follow and come after. And S. Paul sayth, If Christ be risen from the dead, we shall rise also from the same. And to comfort all Christian persons herein, holy Scripture calleth this bodily death a sleepe, wherein mannes senses be (as it were) taken from him for a season, and yet when hee awaketh, he is more fresh then he was when he went to bed. So although we haue our soules separated from our bodies for a season, yet at the generall Resurrection we shall be more fresh, beautifull, and perfect then we be now. For now we be mortall, then shall we be immortall: now infected with diuers infirmities, then clearely void of all mortall infirmities: now we be subiect to all carnall desires, then we shall be all Spirituall, desiring nothing but GOD'S glory, and things eternall. Thus is this bodily death a doore or entring vnto life, and therefore not so much dreadfull (if it be rightly considered) as it is comfortable, not a mischiefe, but a remedy for all mischiefe, no enemy, but a friend, not a cruell tyrant, but a gentle guide leading vs not to mortality, but to immortality, not to sorrow and paine, but to ioy and pleasure, and that to endure for euer, if it be thankefully taken and accepted as GOD'S messenger, and patiently borne of vs for Christ's loue, that suffered most painefull death for our loue, to redeeme vs from death eternall. According hereunto S. Paul saith, our life is hid with Christ in GOD: but when our life shall appeare, then shall we also appeare with him in glory. Why then shall we feare to die, considering the manifold and comfortable promises of the Gospel, and of holy Scriptures? GOD the Father hath giuen vs euerlasting life (saith S. Iohn) to you that beleeue in the Name of the Sonne of GOD, that you may know that you haue euerlasting life and that you doe beleeue vpon the Name of the Sonne of GOD. And our Sauiour Christ saith, He that beleeueth in me hath life euerlasting, and I will raise him from death to life at the last day: S. Paul also saith, that Christ is ordained and made of GOD our righteousnesse, or holinesse and redemption, to the intent that he which will glory should glory in the Lord. S. Paul did contemne and set little by all other things, esteeming them as doung which before he had in very great price, that he might be found in Christ, to haue euerlasting life, true holinesse, righteousnesse, and redemption. Finally, S. Paul maketh a plaine argument in this wise. If our heauenly Father would not spare his owne naturall Sonne, but did giue him to death for vs: how can it bee, that with him hee should not giue vs all things? Therefore if we haue Christ, then haue we with him, and by him, all good things whatsoeuer wee can in our hearts wish or desire, as victorie ouer death, sinne, and hell: wee haue the fauour of GOD, peace with him, holinesse, wisedome, iustice, power, life, and redemption, we haue by him perpetuall health, wealth, ioy, and blisse euerlasting. 1. MacCulloch, Diarmaid, Thomas Cranmer: A Life, page 323.